2019 will see a lot of improvement across the state of Michigan, yet many builders and contractors are in the midst of a shortage of qualified workers. Because the demand for specialized labor will increase the costs and waiting associated with such shortages, many builders are looking for cost-effective solutions that can deliver a top-notch product without any wasted time or materials. This year, structural steel will continue to thrive as a reliable material, especially when fabricated and installed by professionals. Sanilac Steel is here to serve as your trusted structural steel fabricators across Michigan. For more than 50 years, our company has worked diligently to deliver the best results in the safest and most efficient manner. We understand how complex buildings can be, and will work with you every step of the way to ensure that everything is completed perfectly on the first try. Today, we’ll continue to discuss the advantages of steel structure design and fabrication going into 2019. If you have a project in the works and need a reliable source for structural steel, then be sure to call us today! Compared to timber and metal composites, structural steel provides a lot more room for creativity and beauty. Designers often incorporate the strength and ductility of modern steel to deliver a result that conforms to the plans while allowing for less-traditional building elements. Steel’s unsurpassed strength also allows more room for creativity, as fewer materials are required to meet design specifications. This provides more space to allow for other building elements, creating more room to suit a client’s needs. Sanilac Steel has the equipment and expertise to deliver high-quality outcomes for every project, from steel structure design to ornamental metal work, steel staircases, and more. Modern technology and refined processes have helped to streamline structural steel into the building process to make things much more productive. By regulating every process of the design, fabrication, and erection process, builders can work to minimize any errors or construction defects inherent in the process. Over the course of a project, this benefit can help to save money and increase the overall safety of a structure. Sanilac Steel is proud to rely on proven processes while deploying the most modern technology to ensure that we stay ahead of the curve. Our team will work with you to develop a personalized approach to your project that seamlessly integrates with other building elements for a fast, accurate outcome. The maintenance and upkeep for steel buildings are much more advantageous than other building materials. Once the correct format of structural steel is installed, you can expect to benefit from minimal maintenance and repairs. Beams that are hidden from view will require inspections very rarely. If you consider the advantages of this low-care option over the next 50 years, it should be easy to calculate the total cost-effectiveness of modern steel. The American Institute of Steel Construction states that structural steel can last for as long as the owner desires, provided that proper maintenance is performed to prolong its life cycle. Engineers and architects can depend on steel to outlast every other component in a structure, delivering long-lasting support that cannot be matched by any other material. One of the most advantageous aspects of structural steel in today’s modern market is its rate of recycling. A majority of steel products today are fabricated from recycled materials, breathing new life into components that do not negatively impact the environment. In fact, nearly 100 percent of steel can be recovered and reused for other applications. Modern advances have also made structural steel more efficient during the fabrication process, minimizing the environmental impacts with low emissions and very low levels of waste. Your local steel fabrication company will be able to provide their rates of efficiency to achieve certain tax incentives and funding approvals often associated with green building practices. Structural steel is durable, recyclable, cost-effective, and precise, but only if you hire the right steel fabrication company. Builders in need of trustworthy services across Michigan can rely on our structural steel fabricators for complete results. 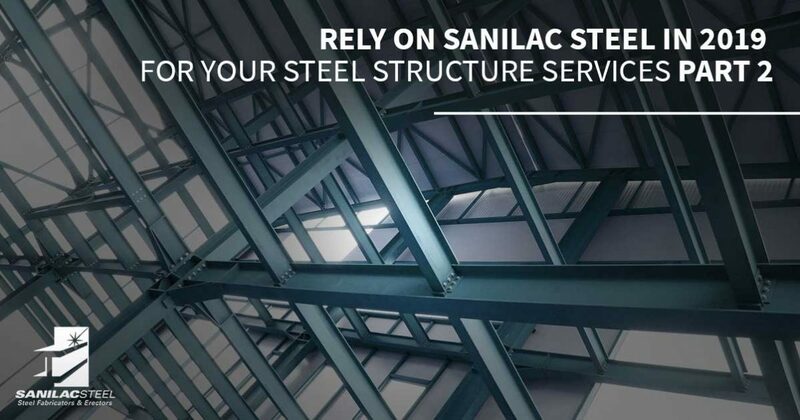 Contact Sanilac Steel today to see how we can enhance the efficiency and accuracy of your project, and be sure to ask us for a free estimate for all of our services!